Heyyy it's time for some crazy stuff again! 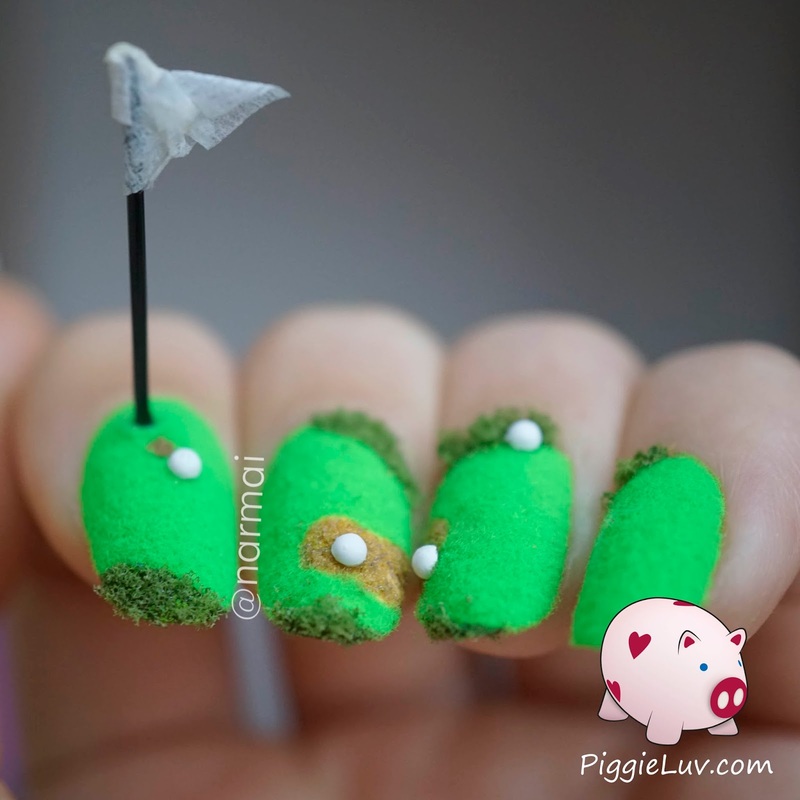 This is a 3D golf course nail art design and what better way to do it than with something sharp sticking up from your nail, right ;-) Click to see more! I swear, I raided the craft room for this. I kept walking back and forth to get more stuff! 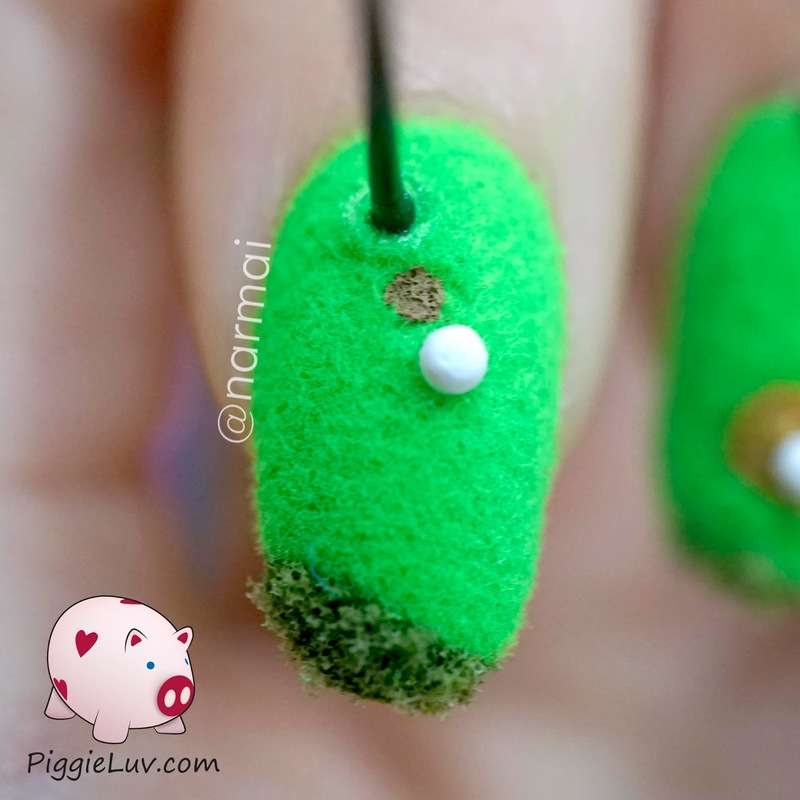 I used acrylic paint, nail foil glue, decorative sand, flocking powder, miniature grass, half pearls from a nail art wheel, a piece of plastic coated iron wire and a bit of tissue paper. Most of these supplies came from eBay, a local craft supply store or I found them around the house. I know I'll get a lot of hate for these, especially on my Instagram account. It seems to be the perfect place to be a dumbass. Please, don't be the person who says "Didn't you poke yourself in the eye?" or "That stick must hurt." No. I do not stick things THROUGH my nails, you'd have to put a lot of force behind it to get it to actually go through. Nails are really tough. Also, I didn't go out wearing these, I am not an idiot. I made them for fun, I took pictures and then I removed then before my fur babies would be snacking on my flocking powder (they like to bite my nails). You guys seem to like videos and I LOVE making these craft-type-videos so here's how to make these! 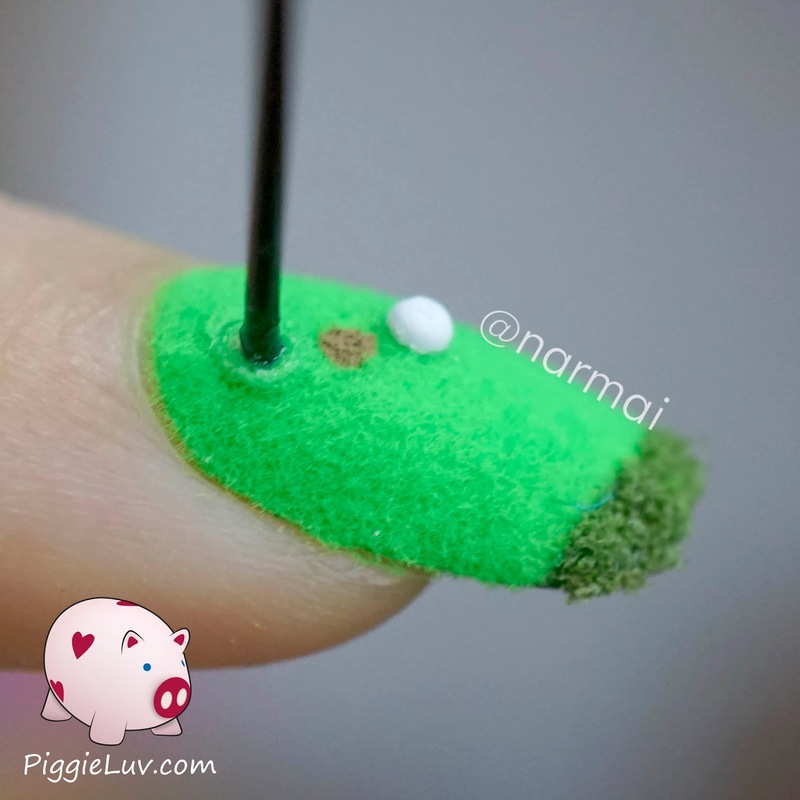 Paint a flat golf course on a white base color, just to supply you with a nice colored base to work on and it will also be easier to determine where your 3D stuff is going to go. Apply nail foil glue, wait until it's dry because then it will be sticky, and apply your sand. Brush off the excess. Do the same for the flocking powder and the crumpled up miniature grass. 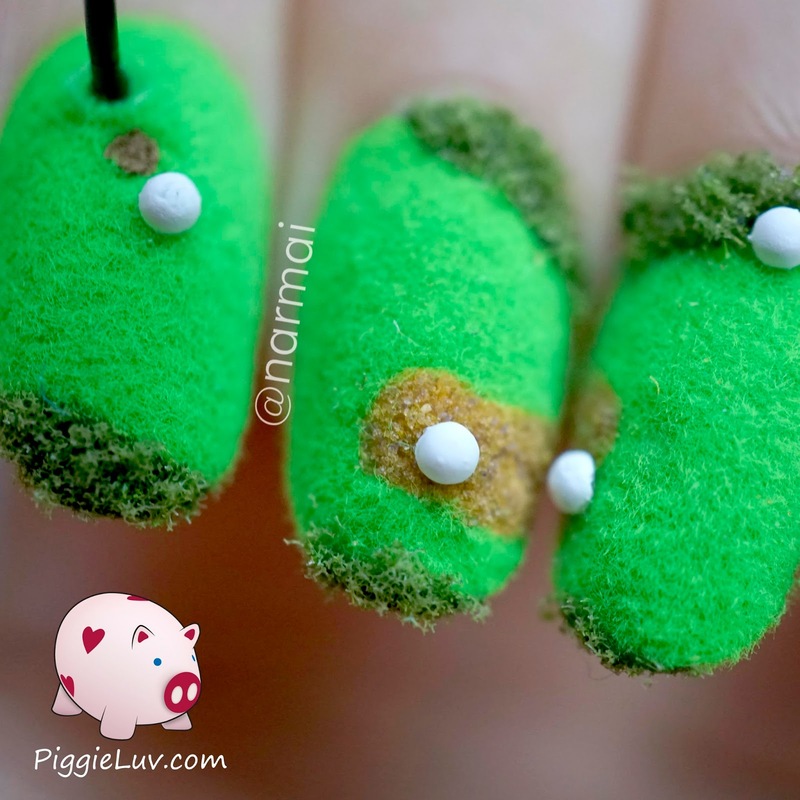 Make a little indentation in your 'grass', I used a pair of scissors but you can use something else you have on hand. Fill in the hole with brown acrylic paint! Take a few half pearls that you use for nail art, and apply them with a bit of nail foil glue. 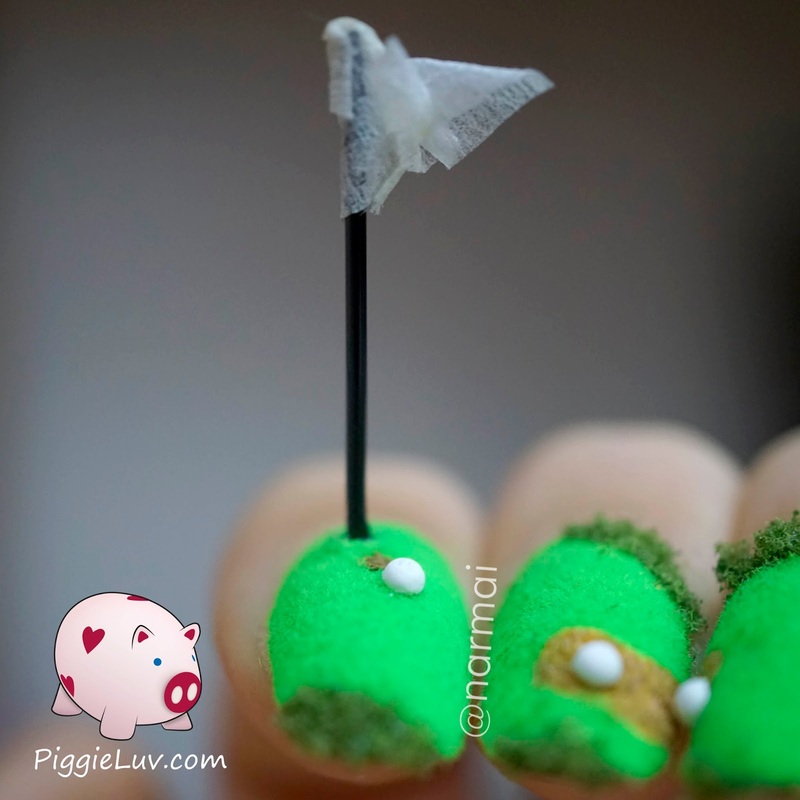 Paint them white and they will be your golf balls! Now take some plastic covered metal wire and cut off a piece about the size of a phalanx (from the top of your finger to the first finger joint. Cut out a square of tissue paper and separate the plies so you'll only have one left. Now put a super thin stripe of nail foil glue on it, place your metal wire in the middle and loosely fold the fabric around the wire. You have your flag! All you need to secure it to your nail is a few drops of top coat, stick it in, wait for the top coat to dry et voilá!